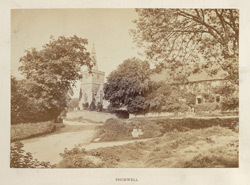 James Redding Ware describes the village of Shorwell as "a perfect nest of ruralities...paradise of shady lanes, while its church - not very important in itself, although it contains one or two interesting brasses - is rendered charming by its setting of trees. In the high noon of summer one has never far to go to find shade in Shorewell. It is a village park."